New analysis by LDC shows some significant trends in the openings and closures of food and beverage (F&B) outlets across the country. ONS data released in February 2017 showed that spending by households on restaurants and hotels was now more than £45 per week, which is the highest in five years. In February last year, NPD Group published figures that claimed Britons spent a total of £52.2bn eating out in 2015 and that this will rise to £54.7bn by 2017. Burgers alone accounted for £4.2bn of spend, with coffee forecast to rise from £2.17bn in 2015 to £2.4bn in 2017. Allegra is even more bullish and forecasts that the UK coffee shop market will be worth over £15bn by 2020 with over 30,000 outlets selling it nationwide. This is a very big number because LDC tracks over 550,000 retail and leisure outlets so this would account for over 5% of the total. It is therefore not surprising that investors and operators have been very active in this sector, whilst the more traditional comparison goods shops continue to decline. A strong F&B offer is now a must for success in any high street, shopping centre or retail park. It has even become more micro than that with the comparison goods retailers such as Next, M&S, Selfridges, Debenhams, House of Fraser and John Lewis all investing heavily in F&B offers within their stores. Co-location within smaller stores is also on the rise, where one might have a bike shop and a coffee shop under one roof. 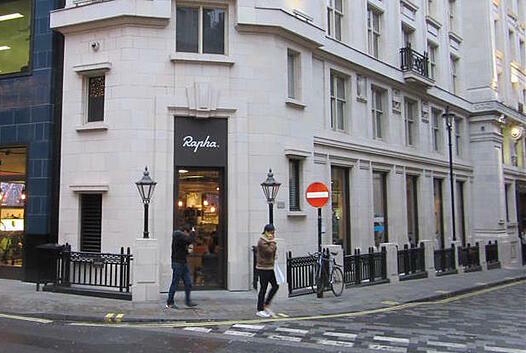 An example of this is Rapha on Brewer Street in central London. From this growth in spend comes an opportunity for UK and foreign investors, especially Private Equity, who have been very active in this sector, with the market attracting a high number of multiples. Byron Burger, Leon and Busaba Eathai are all former startups that have expanded, funded by their backers. 2014 to 2016 saw a plethora of deals with Côte, Gaucho, Byron, GBK, Ask, Zizzi, Strada, Prezzo, Pizza Express, Las Iguanas, La Tasca, The Real Greek, Giraffe, Ed’s Diner and Yo! Sushi all changing hands. I am going to look at the F&B market in three parts. An overview of the market, the fascia trends and then a look at locations and asset type trends specifically. LDC physically surveys over 3,000 Retail and Leisure centres across the UK on an annual or bi-annual basis. In addition to this, we track over 2,000 multiple Retail and Leisure companies and their outlet locations. It is from this very rich and evidence-based research that my statistics come from. As of the end of June 2016, there were c.107,000 restaurants, cafes, coffee shops, fast food outlets, bars, pubs and clubs across Great Britain’s major centres. In the 12 months to June 2017, this number increased by 1.3% (+1,333 units) but nearly 21,000 opened and/or closed which equates to a very high churn rate at 20%. Of these outlets, 71.7% are Independents (less than five outlets nationally, excluding international chains). They increased their number by 839 (+1.1%). Their churn rate was 23% with over 17,000 opening and/or closing. Chain operators also grew but at a faster rate of 1.7% (+494 units) but with a much lower churn rate of 11% which was driven by just over 1,700 openings and closures. There is a clear dynamic of growth here, but also a far higher success and failure rate for Independents. Is this because locations, lease terms, competition and rising costs make it harder for Independents to compete? Chains are generally better funded and can spread risk across a portfolio of locations. Margins are narrowing for the chains as prime rents rise, business rates in good locations increase, people costs rise (living wage and apprentice levy) as well as the cost of keeping up with technology and fashion rises in terms of fit out with many units seeing capital expenditure of £500,000 to £1,000,000. How does the last 12 months compare to the previous years? One might assume that with weak consumer confidence, rising costs and increased competition, the last 12 months would show a slowdown in openings. How wrong one would be, as the annual average rate of change from 2012 to 2016 was much lower than in the last 12 months. The annual average change in the number of F&B outlets from 2012-2016 was +743 which is just over half of that in the last 12 months, so the rate of growth has increased significantly. Regional analysis is also interesting as it shows Greater London (+0.9%) and Yorkshire and The Humber (+0.9%) as seeing the slowest growth rates over the 12-month period (from July 2016 – June 2017) whilst the West Midlands (+1.9%), Wales (+1.8%) and East of England (+1.8%) saw the biggest increases. 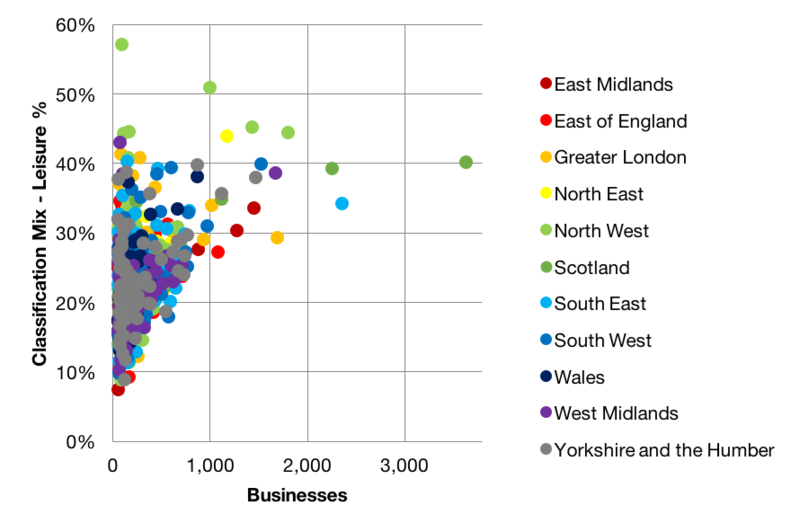 The North West overall has a far greater Leisure offer in its town centres relative to other regions, as Figure 2 illustrates. Another trend is that the larger towns and cities tend to have a higher average rate of Leisure compared to smaller centres because of their ‘destination’ status and larger catchments/population densities. 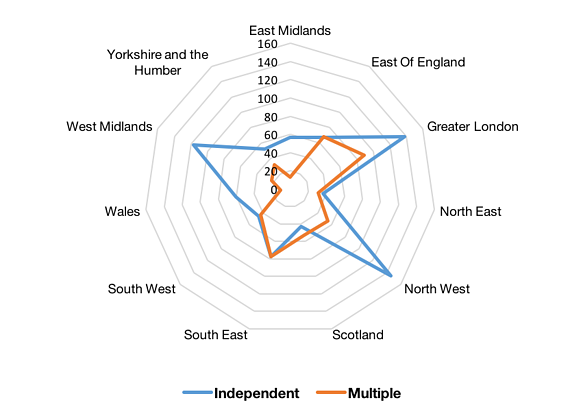 The rate of change between Independents and Multiples also varies by region as Figure 1 shows. Independent activity (and to a lesser extent for the chains as well) is significantly different by nation and English region. As Figure 3 below illustrates, the level of net change is back to the peak of 2013/14 at +1.3% but with a greater number of additional units at +1,333 in 2016/17 versus +1,244 in 2013/14. 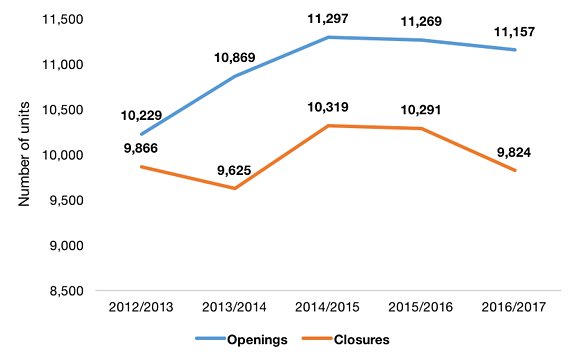 Notably, whilst the net change in 2016/17 is the same as 2013/14, the level of churn (openings and closures) has increased from 20,494 to 20,981 which indicates increasing uncertainty and marginalisation of operations. Which business types are driving this growth? The picture here is varied with Bars, Pubs and Clubs being the only category to see a drop in the number of outlets (-207). This was mainly driven by the closure of chain Pubs nationally, albeit at a slower rate than the previous year (-0.8% vs. -1.6%). The Cafés & Fast Food category saw the biggest growth in outlets (+946), but Restaurants had the highest percentage increase in the 12- month period from July 2016 at +2.4%. Pubs (-254), Indian restaurants (-79), Night Clubs (-74) and Chinese restaurants (-62) all saw the biggest drops amongst the F&B categories. These drops were mainly due to changes in nightlife trends, competition from online ordering platforms, changes in immigration policies (Bangladeshi/Indian chefs) and, more specifically for Indian restaurants, the next generation not wanting to follow their parents' line of work, but seeking employment in other sectors with more sociable working hours. Café & Tearooms (+409), Independent operators in general, Coffee shops (+225), Take-away food shops (+215) and Restaurants & Bars (+210) saw the biggest increase in outlets since July 2016. 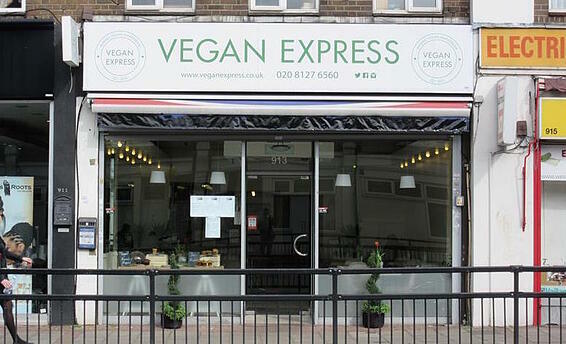 The number of Vegan restaurants more than doubled; along with significant growth in the number of Jamaican, Middle Eastern, Caribbean, Turkish and American restaurants. Lounge bars, Juice bars and Pizzerias also increased in number. This might come as a surprise, but Internet Cafés do still exist - there are over 450 of them - but their numbers, unsurprisingly, fall year-on-year and the last 12 months (from July 2016) saw a further loss of over 10% of outlets. The only Burmese restaurant we track also closed and the generic restaurant offers that we classify as International and Brasserie also saw significant closures. 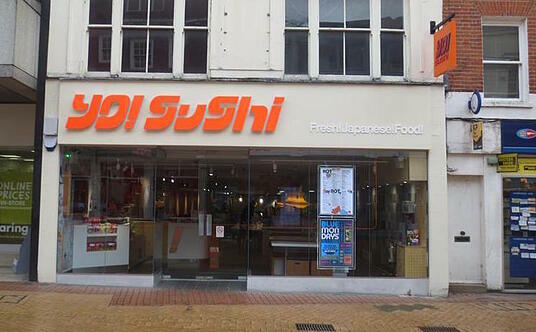 Egyptian, Malaysian and Mongolian restaurants all reduced their presence on our high streets. The night time economy is one that is less understood but is an important part and attraction point for many towns up and down the country. Whilst Lounge Bars with extended licensing hours have increased, the number of nightclubs has reduced significantly with over 74 closing - 6% of the total stock. Italian restaurants, with over 3,700 outlets, have the largest presence; closely followed by Chinese takeaways, with nearly 3,400 outlets. The breadth of cuisine continues with Nepalese, Danish, Swedish, Iranian, Mongolian, Afghan and Korean (to name but a few) all having a good number of outlets. So, the F&B market in the last 12 months has continued to grow at an even faster pace than before, but with margins reducing at the same time, can this rate of growth can be maintained and will the level of churn (which is already high) increase? Considering planning requirements for F&B, it is increasingly important for councils and landlords to understand what a sustainable offer in their locations is, as all too often I see examples of over-supply in a certain restaurant type, which then leads to increased closures, as all struggle to survive. Burger outlets is a case in point and earlier this year The Handmade Burger Co closed their unit in East Kilbride Shopping Centre after having opened just nine months earlier. At what cost - £1m or more? Part 2 of this blog will be released in two weeks, so make sure you check back for the next installment. For any questions around this data, or how LDC can support growth in your F&B business, email the team at sales@localdatacompany.com.